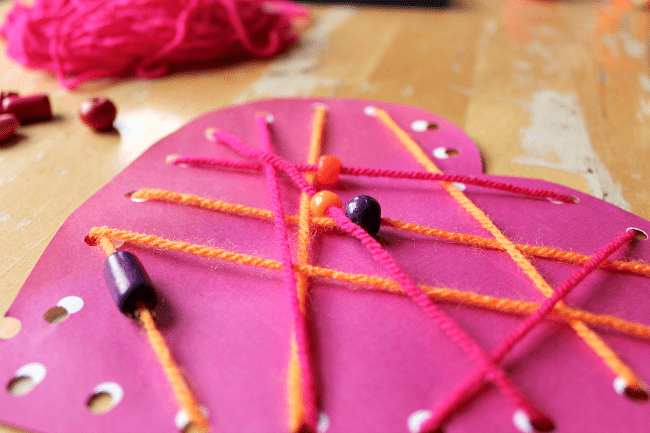 Weaving, lacing, and threading are all wonderful workouts for fine motor skills, helping children develop strong and nimble fingers. :: Print out the lacing cards. There is a red heart and a pink heart, and you can print as many as you need for your family, class or community group. Print on card, which is easier than paper for children to hold and lace. :: Use a hole punch to make holes around the outside of your heart. Depending on the age of your children you might assist with this, but I bet they will love to use the hole punch themselves. 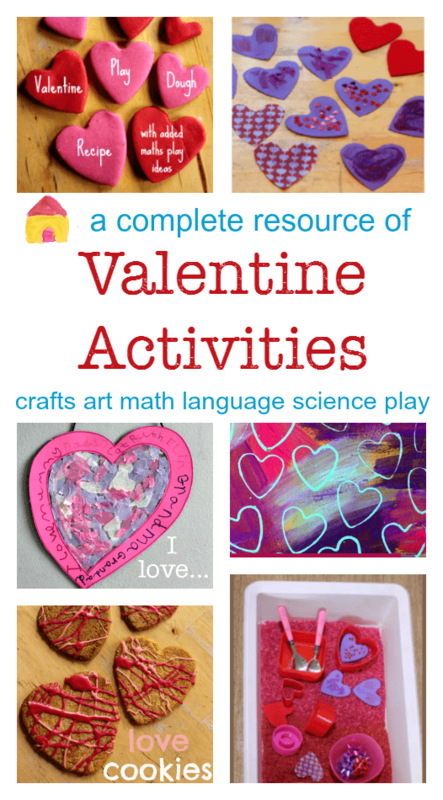 :: Remember that their heart doesn’t need to look ‘perfect’ – there is huge value in letting children develop independence and creative free-choice as they try out these new materials, tools, and skills. 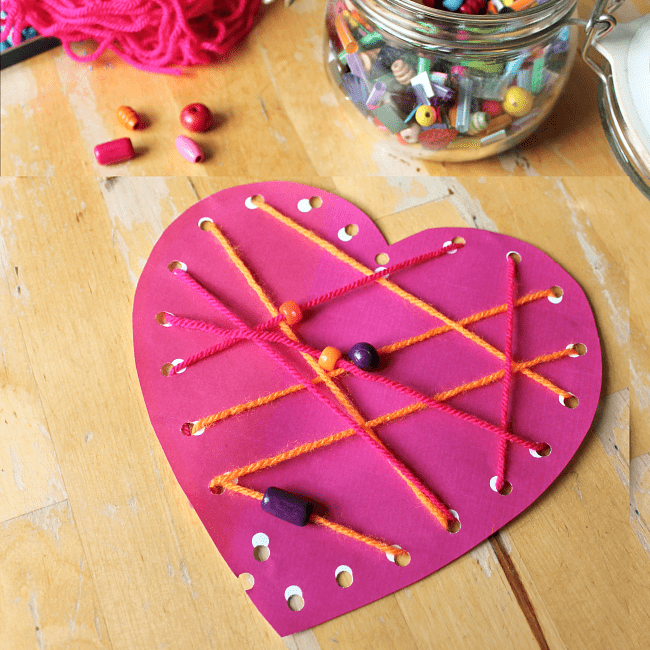 :: Offer a few choices of yarn, string or thin ribbon so your children can choose which they would like to use. 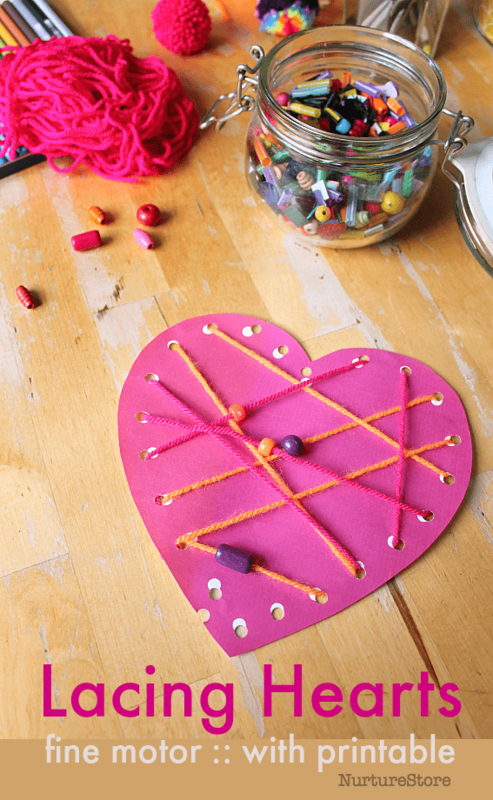 :: Start to lace your heart with the yarn/ string / ribbon. Tape the very end of the thread to the underside of your heart to stop it pulling all the way through the hole while you’re working. :: You might use a blunt darning needle to ‘sew’ through the holes, or use your fingers. If the yarn is frayed and a little difficult to lace, wrap some tape around the end to give a neat edge which will be easier to thread through the holes. :: When you have finished tape the end of your yarn to the backside of the heart so that your beautiful artwork doesn’t unravel.